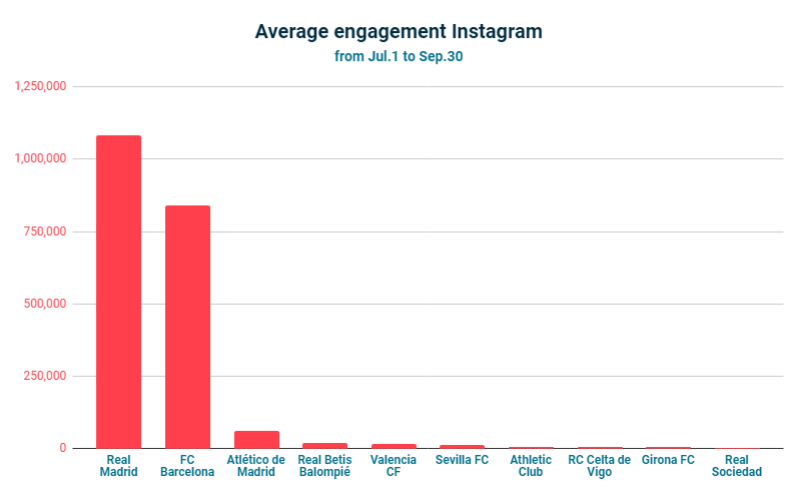 With the first quarter of the 2018/2019 season over, here at Blinkfire Analytics we’ve put together a few charts on Facebook, Instagram, and Twitter engagement for LaLiga teams. 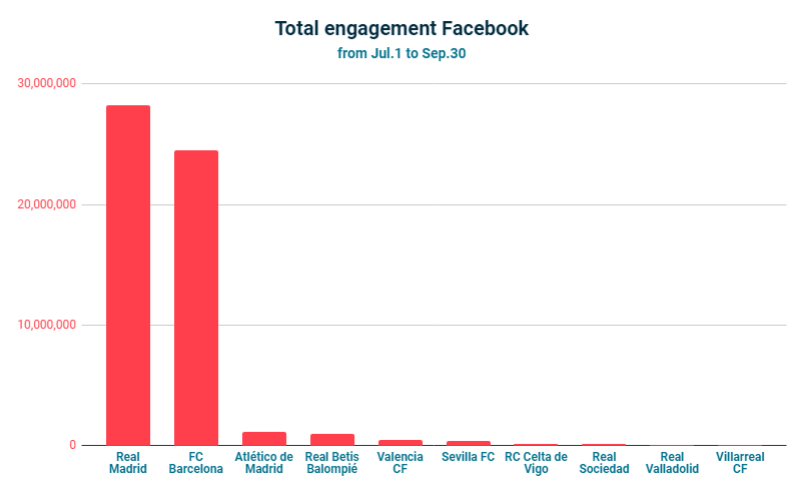 If we take a look at the total engagement earned, FC Barcelona is the team with the best engagement numbers (over 250 million), followed by Real Madrid, Atlético de Madrid, Real Betis, and Valencia CF. 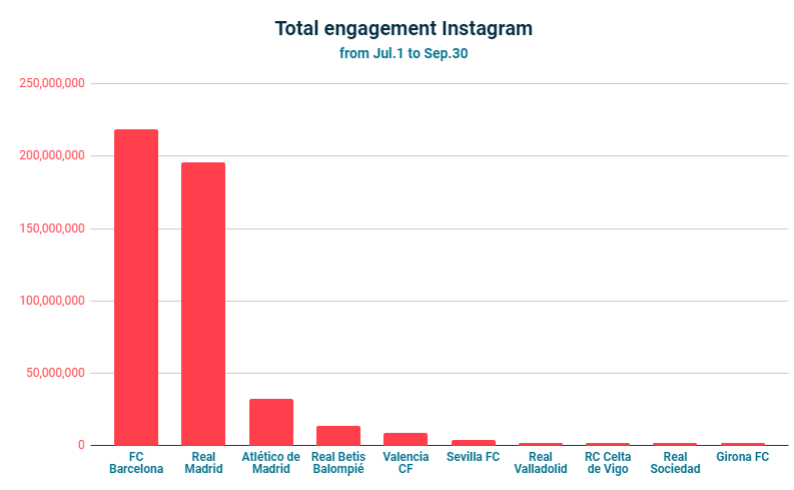 However, if we do the same exercise but take into account the number of posts shared, Real Madrid leads the way with nearly 50,000 interactions per post from Facebook, Instagram, and Twitter. Other teams like Girona FC or Celta de Vigo jump to position five and six within the top 10, while SD Huesca moves from position 16 to 10 and RCD Espanyol lands at position nine from 11. If we break down the data by social channel, we see the following rankings. 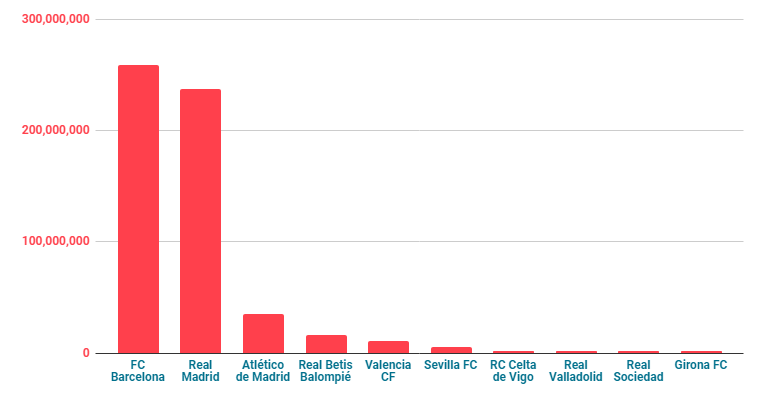 Once again, soccer giants Real Madrid and Barcelona share the first position (Madrid on Facebook; Barça on Instagram and Twitter), with Atlético de Madrid, Real Betis, Sevilla, and Valencia behind them. 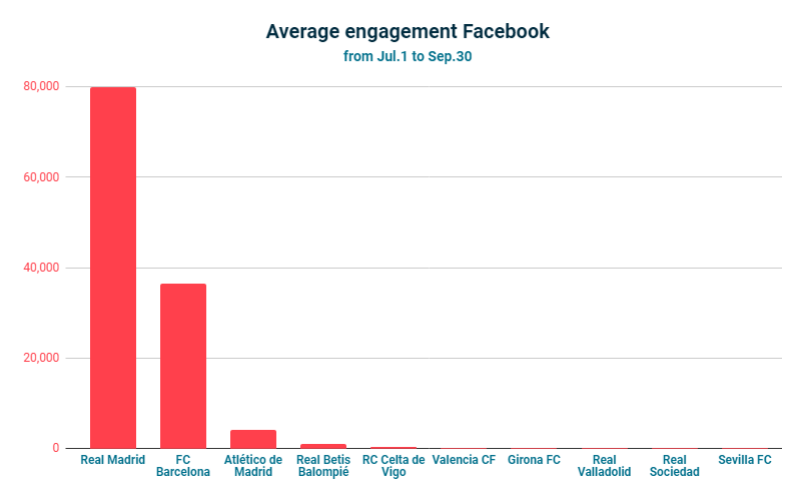 Focusing on the average engagement per post, Real Madrid leads the three channels with nearly 80,000 engagements on Facebook (the other nine teams in the top 10 have less than 43,000 cumulative engagements) and more than one million engagements on Instagram (the other nine teams fall well below one million). 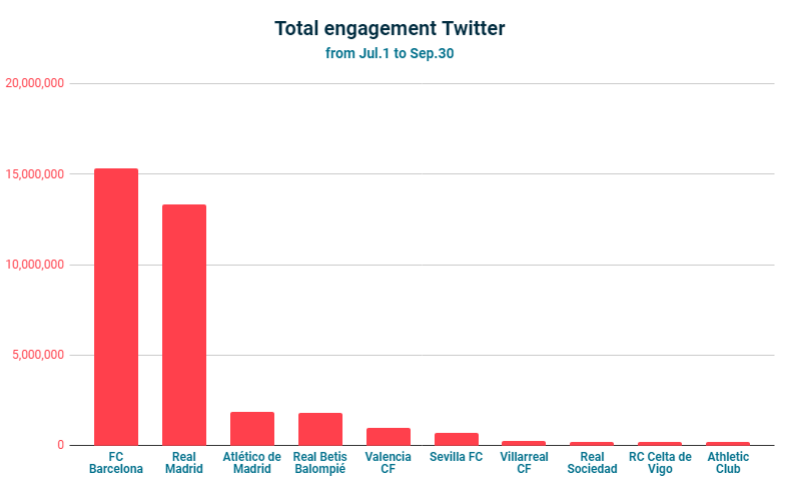 In the first three months of the championship, Real Betis has had the third best average engagement per post on Twitter, while SD Huesca was the sixth. 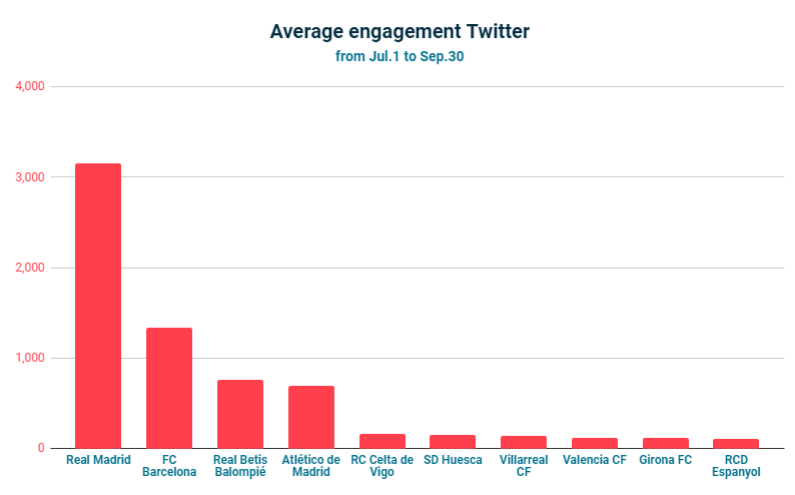 It’s interesting to note that Celta de Vigo has the fifth best average on both Facebook and Twitter. 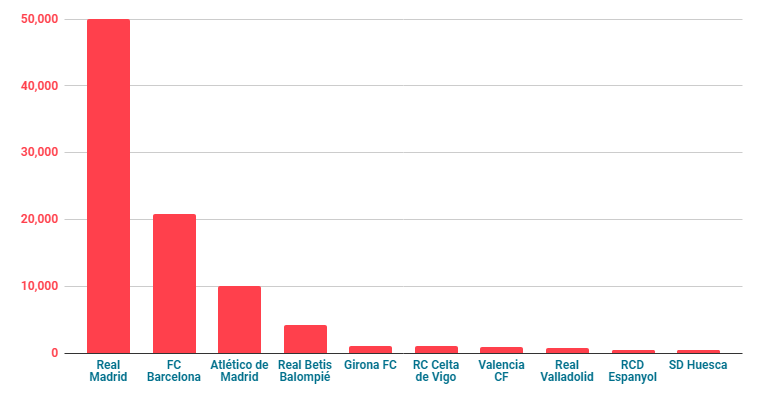 In January we’ll take another look at LaLiga team data. While the results on the field will definitely affect the numbers on social media, a solid social strategy and quality content are also key elements to engage with users and, of course, increase social revenue.